The summer of 1793 the Revolution faced its greatest crisis. Violent internal rejection of the Revolution became more widespread and menacing than the short-lived counter-revolutionary gatherings at the ‘Camp de Jalès’ in the south in 1790–92. The Convention had responded to the expanded military crisis by ordering a levy of 300 000 conscripts in March. In some regions the levy was implemented without difficulty, but in the west it provoked massive armed rebellion and civil war, known, like the region itself, as ‘the Vendée’. This was a region where the seigneurial regime had weighed relatively lightly and where a numerous, locally recruited and respected clergy had played a pivotal social role in communities of dispersed habitat. The Revolution had caused most people here little but trouble, forcibly removing the mass of non-juring clergy, increasing taxes and now conscripting young men. Erupting at a critical time for the young Republic, the rebellion evoked a visceral, punitive response. The rebels had begun by seizing the small town of Machecoul, where they had singled out, tortured and killed at least 160 ‘patriots’. The vicious cycle of killing and reprisals convinced both sides of the treachery of the other, and this was exacerbated by the nature of the fighting in the bocage of high hedgerows and narrow paths suited to guerilla-type ambushes and retreat. The ‘Catholic and Royal Army’ established headquarters at Châtillon-sur-Sèvre (today Mauléon), and on 5 July 1793 inflicted a heavy defeat on republican troops under the command of François Westermann. Only 300 of his 7000 troops survived. Westermann would not forget the need for revenge. Ultimately, the civil war was to claim perhaps as many lives as the external wars in 1793–94, with deaths of possibly 170 000 Vendéans and 30 000 soldiers. 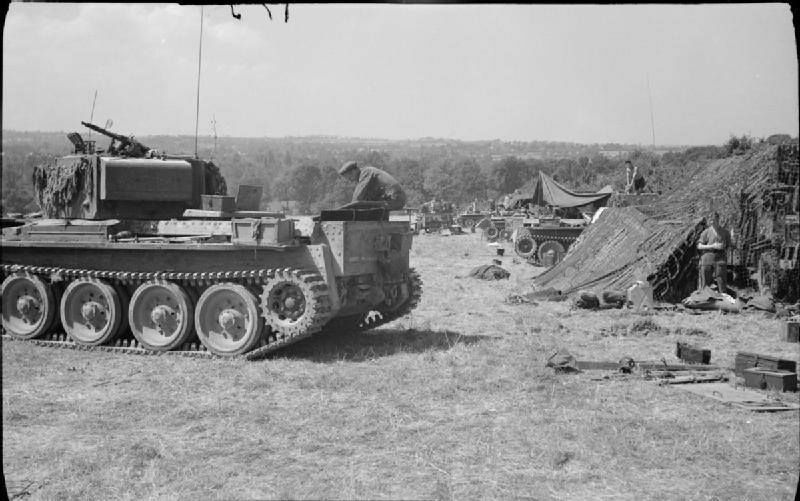 During June 10th–12th, the 51st Highland Division pushed inland from the ‘airborne bridgehead’, menacing Cagny but never threatening to reach it in the teeth of 21st Panzer Division’s opposition, while the 7th Armoured Division struggled southward from Tilly towards Villers-Bocage. It was the first serious venture into that difficult and most characteristic Norman countryside. ‘Pleasantly shaded woodland’, says Larousse for ‘bocage’. The woodland stands between small, thickly banked hedgerows, enclosing fields first won from the waste by Celtic farmers who tilled the land before the coming of the Romans, and separated by narrow and winding lanes. Through over a thousand years of growth the roots of the hedgerows have bound the banks into barriers ‘which will rebuff even bulldozers’, while winter rains and the hooves of Norman cattle have worn the surface of the roadways deep beneath the level of the surrounding fields. The countryside is thus perfectly adapted to anti-tank defence. Tank crews which will brave it must expect a bazooka shot from every field boundary or risk ambush in lanes so constricted that they cannot traverse their turret. And if, in the hope of faster progress, they cling to the larger roads, they will be brought every few hundred yards to strong, stone-built villages in which every house forms an infantry fortress, every barn a hiding place for an anti-tank gun. Bocage, for all the soldiers of the Liberation armies, swiftly lost its pleasant sylvan undertones. 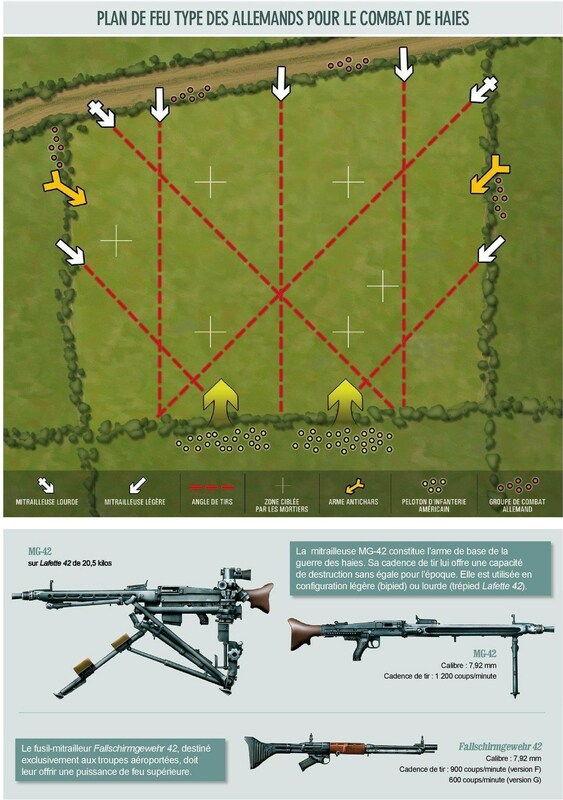 Bocage came to mean the sudden, unheralded burst of machine-pistol fire at close quarters, the crash and flame of a panzerfaust strike on the hull of a blind and pinioned tank. 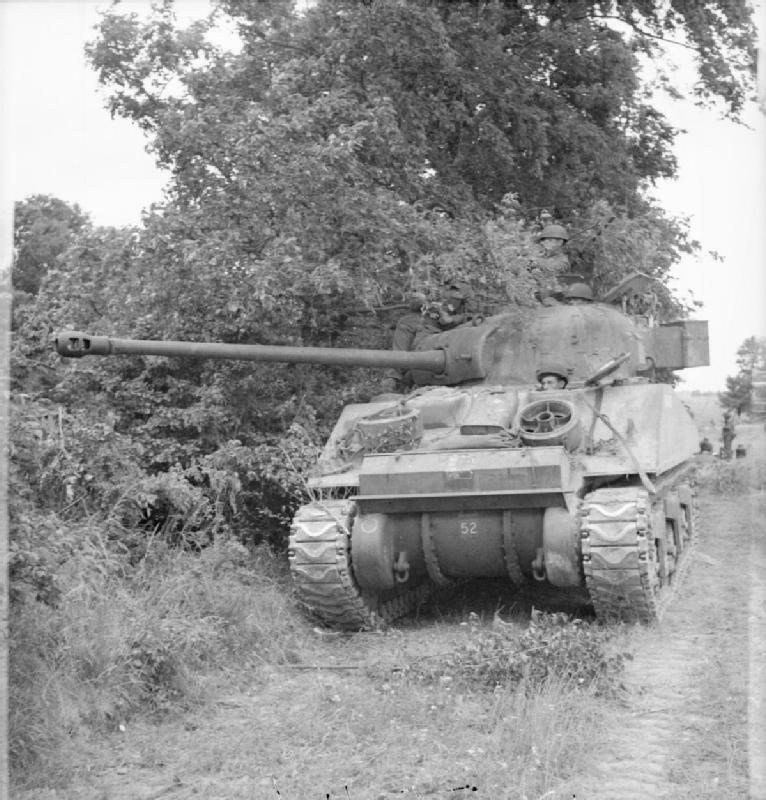 Unlike the US sector where the hedgerow country extended for over thirty miles south of Carentan, in the British sector patches of small embanked and hedge topped fields and orchards were to be found, normally around villages and in valleys. One of the more extensive areas of bocage was to be found on the ridge between the sea at Franceville and the Bois de Bavent to the south. The German defenders employed superb camouflage tactics, whether they were infantry or armour. Anyone who fought in the bocage country in June, July and August 1944 will never forget it. For the next two and a half weeks – until 31 June – the division took up a mainly defensive role in the Norman bocage. 22nd Armoured Brigade were in reserve around Ste Honorine-de-Ducy, 4 miles north of Caumont. The Queens Brigade and 1st RB held a line 2 miles south-east at La Palmerie, Livry and Le Pont-Mulot. 8th Hussars had a mobile role covering the eastern flank, La Butte north to St Paul-du-Vernay, which 50th Division were holding. Major Elliott o/c A Coy asked for a tank to be sent up in support of his men pinned down in slit trenches. I was ordered to direct the tank up to his position, so I climbed up, gave orders to the tank commander through the turret. We crashed through the hedges in great style and charged up to the trenches with engines roaring and me clinging to the turret. The men raised a great cheer in greeting. Shortly afterwards the CO visited A Coy and was heard to tell [Major] Russell Elliott ‘You will defend this position to the last man and the last round.’ The CO returned to Bn HQ and was greeted with the radio message. ‘Major Elliott has just been killed.’ Spontaneously the CO said ‘He can’t be – I’ve just spoken to him.’ Russell had been killed by a shell bursting overhead in a tree. He had led his company across 2,000 yards of mine fields at Alamein, survived the drive to Tunis, the landing at Salerno, the drive across the Volturno and the Normandy landings. As they said in the First World War ‘His number was on it.’ [A roving Tiger tank was causing problems and] Brigade whistled up an M4 – a self-propelled 17-pounder on a tank chassis commanded by a rather jolly lieutenant (Norfolk Yeomanry) – a weapon which looked most impressive and turned out to be so. Some 20 minutes later the lieutenant, even jollier, described how he had stalked the Tiger up and down the hedge and knocked it out. Sure enough I went to inspect it – a grisly sight, burnt out with the tank commander’s body draped over the turret, minus the jacket. On 19 June the BBC Home Service broadcast a radio programme about the division, and on the 22nd Lieutenant-Colonel Rankin arrived to take over command of the unlucky Sharpshooters. I have worn the same clothes for seven days running as have we all but I know they must take us out of battle soon, for we are beginning to reach the limit of our endurance. We must come out of battle to lick our wounds and re-equip. God! … but in Normandy the days are long. It is still summer – the long evenings stretch for ever and the nights are too short. The imperturbable Brigadier ‘Looney’ Hinde announced that ‘no further purely armoured breakout was contemplated, that 7th AD was in reserve and a hard-slogging infantry battle lay ahead, supported by armour’. He was quite wrong. When Operation Goodwood took place the armour and infantry – desert fashion – fought their own separate battles. a solid and capable man who had previous experience in the desert. He was philosophical about it all and was very welcoming and supportive of me. Piff Threlfall, my Squadron Leader, had fought throughout the desert campaign with great distinction. To me he was a demi-god, totally unflappable and I was always prepared to listen to him. I trusted him implicitly and was quite prepared to risk my life for him if he should demand it. Bill distinguished himself by berating his colonel, Colonel ‘Cuthie’, and Brigadier Hinde, when they visited his front-line troop, because they carelessly strolled diagonally across the fields and thus gave away the 8th Hussars’ positions! I was leading the patrol along the hedgerow when I heard the click of a bolt being drawn back, so using my ‘Instinctive Pointing Sense’, I fired a burst from my Sten gun in the direction of the sound. There was a groan and a rush of feet. On investigation we found a German lying dead behind a Spandau. My burst had hit him between the eyes. This showed the value of the IPS!! … so the patrol hoisted the corpse and I grasped his hands round my neck in front of me. This entry was posted in British, Doctrine by MSW. Bookmark the permalink.